Last week, Thai authorities shut hundreds of schools after a sharp drop in air quality. Weather patterns, vehicle fumes, construction dust and the burning of trash have been blamed. The Thai capital is grappling with a second year of spiking seasonal air pollution, prompting people to snap up so many filters and masks that supplies are dwindling. Residents fear a long battle lies ahead to keep the toxic smog at bay, signalling growing opportunities for purifier makers such as Sharp or mask manufacturer 3M in the city of roughly 10 million people. “As you can see from our websites and stores, our air purifiers are all sold out,” said Yol Phokasub, president of Central Group, which owns Thailand’s top developer of shopping malls. Other local retailers, such as Berli Jucker and Home Product Centre, are also unable to keep up with demand. Berli’s CEO Aswin Techajareonvikul said the firm is looking for new suppliers of pollution masks. Last week, Thai authorities shut hundreds of schools after a sharp drop in air quality. Bangkok at one point had the fourth-worst smog globally among major cities, based on an index compiled by start-up monitoring firm IQAir AirVisual. 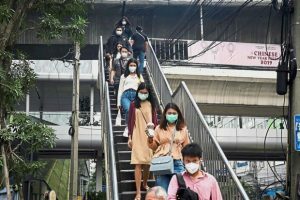 While the pollution problem isn’t as bad as in places like New Delhi, haze awareness spread rapidly among Bangkok’s residents this year. More than 2 million people are tracking Bangkok on the IQAir AirVisual app, compared with about 80,000 for the Indian capital. While some businesses may benefit from demand for products that fight smog, the metropolis as a whole is at risk of being the big loser. Bangkok is the world’s most visited city and relies on tourism for economic growth, but the haze may repel visitors.